October 6, 2014, 12:57 PM · Sometimes when a student brings me orchestra music for trouble-shooting, it's not the notes that are the problem. It's the rests! Trouble with rests points to trouble with counting, and that makes for trouble with sight reading and fitting together in orchestra. It's all too easy to nod off into dreamland during the rests and hope that you'll emerge from the clouds when the music sounds right for your next entrance. However, the dream-and-hope method is extremely unreliable and leads to stress, especially when everyone in the section has chosen this non-method. It's unkind to your section leader, as well. When one starts missing entrances, this preys on one's confidence and leads to hesitant playing and orchestra jitters. It can infect the whole section; it can infect the whole orchestra. Not good! One effective way for a student, or anyone, to gain control over his or her orchestra playing and overall ability to count is to start taking responsibility not just for the notes, but for the rests. As with everything related to the violin, counting rests requires practice, and the more you practice, the more this becomes a natural and easy part of your everyday playing. The easiest way to acquire this discipline? Count every single rest in every single measure, even when there are 65 measures of rest. Even when it's a half-measure of rest. Keep track! Does this sound "un-musical" to you? Well, that is the difference between listening to music and making music happen. As the discipline of counting becomes more ingrained, you'll learn to "feel" it (while still counting), but when you break it down, creating music is something that happens in time, and you have to learn to parcel it out, just like you need to learn to put your fingers on the right spots, wiggle your hand just-so to create vibrato and draw a straight bow to make a good tone. Making music is not a spontaneous dance, it's a production, one where you have to be right on cue. So even when your next entrance seems easy and obvious -- especially when your next entrance seems easy and obvious! Get your brain in the habit of keeping track of every beat. You'll soon find yourself to be one of the most valuable members of your orchestra section -- the one who enters with confidence and reliability. October 6, 2014 at 09:22 PM · Laurie, you've certainly got more orchestra cred than most of us out here, so I'm strongly inclined to regard your opinion with the respect it clearly deserves. But I have to say this doesn't work for me. I'm more likely to miscount. That is, I'm more likely to enter accurately by figuring out what some other section is doing right before my entrance, and watching the conductor who knows he's got to cue entrances after long rests. I notice in the picture that you selected to accompany your post that there are ghost notes (or whatever they're called) from some woodwinds. That's something to teach ... if those notes aren't there, ask the conductor to see the score, find something in one of the sections that is unambiguous, and write it into your part. If it says "8 bars of rest" (in notation) then change the 8 to a 6, insert two bars, and write in the ghost notes for yourself. I've watched small community orchestras, admittedly these are not professionals, but invariably there are people in the first violins nodding their heads and moving their lips as they count through 40 bars of rest -- in a performance. So I can see the merit of counting long rests for a first reading of a piece, But I think doing it after that invites people to cultivate some pretty bad habits. And I'm not convinced it's necessarily more accurate. Especially in a pit orchestra where the rests can be VERY long and you are constantly tempted to be distracted by the actors on the stage. I have a LOT of pit orchestra experience from my high school years and nobody ever counted rests. October 6, 2014 at 09:34 PM · I have professional friends who claim to rarely punt rests especially in standard repertory with cues. They rely on their experience and ear. October 6, 2014 at 10:23 PM · Count your rests AND put the cues in your part. You should know what the music before your entrance sounds like several measures in advance, but you should NOT just sit there and wait to hear that music. You should be counting as well. October 6, 2014 at 11:27 PM · I agree with Claire. There are times (especially in non-pro orchestras) when the cues you're waiting on don't happen, or don't happen right. You have to count, too. Rather, you have to count first, and listen second. October 6, 2014 at 11:45 PM · Just as a matter of interest, Paul, just how long did you spend practising counting all the rests before you realized that it doesn't work for you? If you haven't practised it for longer than I have, you haven't practised it. October 7, 2014 at 02:33 AM · Thank you, Laurie. It is SO frustrating to sit next to someone who relies on ear and/or experience, or just hopes to get it right. The best system I've found in some 42 years of various levels of orchestra experience is to count AND listen. Listening alone is just not safe--suppose two cues you rely on come in differently--one is right, one is wrong, but which? if you count you know where YOU belong in the scheme of things. Counting by itself can lead to wandering minds, but if one's involved aurally and numerically, it's best. October 7, 2014 at 02:46 AM · Indeed, listening alone is not reliable! There are also times when the musical theme comes several times, and so those aural cues or ghost notes actually may lead you to enter early, thinking that you have heard your cue. October 7, 2014 at 02:46 PM · What happens to y'all rest-counters if you happen to lose count in the middle of 20 bars of rests? If you don't know the musical cues, then you have no hope! Never happens? You don't think you might lose count if your stand partner's bridge suddenly snaps? To answer John's question, how many times do you need to drive drunk before you realize it doesn't work very well? Until someone dies? It was really my pit orchestra experience that put me off from counting long rests. I'd love to be able to reliably count rests regardless of what is going on around me, but someone once famously said, "A man's got to know his limitations." Just a couple of weeks ago I was having trouble understanding a cue from the cellos in the Egmont Overture, and a quick look at the score totally settled it. Another question -- when you're performing a solo concerto, do you COUNT through the introduction too?? Or if you're playing, say the Mozart 3, do you just wait until you hear that sequence of low D's in the first violins? After all ... they might blow it! October 7, 2014 at 04:49 PM · I used to have trouble keeping track of long sections of rests (measures and measures of rests) until I developed a system to help. I count the measures in my head, and depending on how many measures of rest there are, place a finger gently down on my violin and/or put light pressure on my "bowing fingers" one by one (while holding my violin & bow in rest position) for every one, two, five measures etc. It helps to prevent me from losing track of where I am in long measures of silence. I hope this makes sense for everyone, because this has helped me tremendously. In fact, I have never gotten lost in a piece since implementing this. October 7, 2014 at 04:52 PM · Part of my point is that with practice, you learn how to keep track of those measures on a deep level, so you aren't losing track. When you have cultivated that ability, then you are confronted with a piece where the meter changes every few bars, then it's something you can handle with much greater ability. October 7, 2014 at 04:58 PM · Laurie, great post! You actually answered a long standing question. As a dancer, I used my ear only, with the exception of some complicated Stravinsky ballets by Balanchine. And boy were they complicated! Lots of counting. But, as a musician, that only worked part of the time. I think it takes a combination of both, and it depends on the piece you're playing, if you're the soloist, supporting player (which tend to have more complicated counts). I can say with authority that ear only doesn't work, as witnessed by my many missed entrances in high school orchestra, and glaring looks by my stand partners! October 7, 2014 at 07:12 PM · Although I appreciate the need for the ability to count rests, I think Paul has some very good points. There are other ways to keep track of where you are than just counting. And what happens if you're in a small group - possibly without a conductor - and the lead instrument muffs the count? If you can jump with him you can salvage what would otherwise be a train wreck. And if it's you that has miscounted, if you know how to figure out where you should be, you can get yourself back on track and again avoid disaster. There are various cues you can use to figure out where you are. 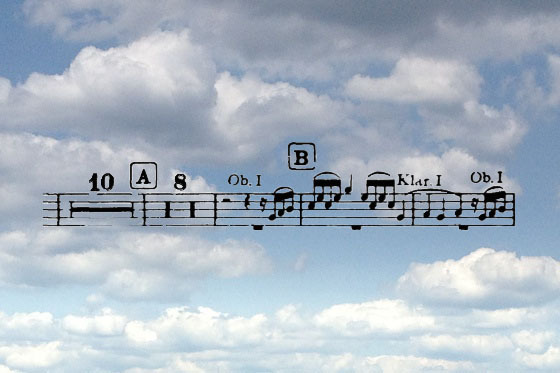 In that bit of music in the clouds, note the two separate rests (10 and 8 measures). Yes, you say, that's because there's a practice mark between them. But whether there's a mark between them or not, listen closely. You'll notice that there's some change in the music at that point. It might be a key change, or a tempo change, or just the start of a different musical phrase. There's usually something that will tell you exactly when you've reached that point. And, of course, having a bit of another instrument's part written in is very helpful. The two skills - counting and feeling where you are - are complementary. A good musician will have both. October 8, 2014 at 04:55 AM · Hannah, with those skills you should take up blackjack! My daughter's cello group is working on Sevensong. She is the youngest member (8). There is absolutely no way she can count the rests. The meter of the piece is crazy. At her last rehearsal she was the only one to "get" one of the entrances because she did it by ear. October 8, 2014 at 05:23 PM · Don't underestimate your daughter, Paul! It's the counting that helps in pieces like that. Counting, plus your ear. not quite in the same vein as this blog, but worth a read. I'd say I tend to rely on a hybrid of listening and counting. I'm trying to be more astute about the counting though.... making a point of doing it even when I don't think I need it just to be in the habit. It's good to have as a fall-back. It is a skill that can be improved and can be vital for group music. October 9, 2014 at 07:44 PM · Paul, your daughter's situation sounds like us working on Rodrigo's Concierto de Aranjuez. The third movement flips back and forth between 2/4 and 3/4 so many times that sometimes I just forget about counting and listen for the phrasing. October 11, 2014 at 12:03 AM · Christina, that's a great blog! October 13, 2014 at 02:12 AM · Couldn't agree more with your comments about counting rests. Congratulations on your article! I always tell my students that if they don't count, and don't get in the habit of counting, then they are not involved. Incidentally the parts for Vivaldi in the common Italian publication ("Ricordi"?) are very difficult to count as they are usually put together in blocks of 5 bars, and this, combined with Vivaldi's unequal phrase lengths, often bear no relationship to the actual music. It is very easy to get lost in Vivaldi on the first play through even if you are an expert counter. One other thing that might be handy for orchestral counting is to use the 'fingermath' method of counting (see http://www.amazon.com/The-Complete-Book-Fingermath-Scientific/dp/0070376808) It is a great way of keeping track of bar rests that are longer than 10!